Coverstitch Insert Table to be installed right of needle, when upper looper is disengaged. I just recommended your company to a friend. I was extremely pleased with the service. They matched a price I had found when looking for the serger. The shipping was unbelieveably fast. The whole experience made me decide to shop first with Allbrands. I'm really excited about my serger, unfortunately I am unable to unpack & use yet with work matters. I was just starting to look at the machine & could not believe the offer on it so just had to buy it now! I absolutly would recommend Allbrands. Thank you for the free sewing machine! I was so surprised to receive it. I hope your prosperity is great in the coming years. Than again!! I am so excited and grateful for the free machine. Thank you! 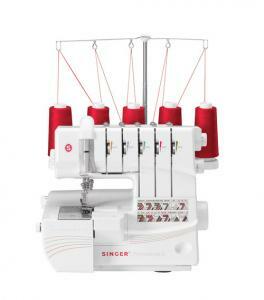 I received my Singer 5 thread serger in very good condition and very quickly. I really enjoyed watching my order go through your place all the way to my place. Everything that should be in the box was in the box. Thank you very much for such good service.